Overview & specs of GPO Ambassador 3-Speed Bluetooth Record Player - Green and Black by Currys PC World. Top features: - Portable turntable to enjoy vinyl records in different places - Built-in speakers let you listen directly without needing external speakers - Bluetooth streaming lets you play music wirelessly from your smartphone or tablet - Convert music from your vinyl collection into digital formats like MP3 - Built-in RCA jacks let you connect additional speakers Portable turntable The Ambassador Portable Turntable lets you enjoy your favourite vinyls without being tethered to one location. With a distinctive briefcase design and rechargeable battery with up to four hours of playback, the turntable supports three playback speeds so you can enjoy every record in your collection.Built-in speakersBuilt-in speakers mean you don't have to worry about transporting external speakers with you. When you don't have access to your records, the turntable can play songs from a USB device using the USB 2.0 port. Connect a smartphone or MP3 device via the 3.5 mm jack to listen to your digital collection.Bluetooth wireless streamingAccess even more music wherever you are via Bluetooth - stream directly from your smartphone, tablet or MP3 player to the turntable's built-in speakers from services like Spotify and Deezer.Alternatively, use Bluetooth to connect with a wireless speaker like the GPO Westwood (sold separately) for portable, cable-free audio. Convert music from your vinyl collection into a digital format You can create digital versions of your vinyl collection using the Ambassador to enjoy your music with ease on a wide range of devices. Simply connect the included USB stick to the turntable and start converting your favourite records into MP3 format. Built-in RCA jacks As well as being portable, the Ambassador can be mains-powered. Attach additional speakers using the built-in RCA connections for richer, fuller sound. 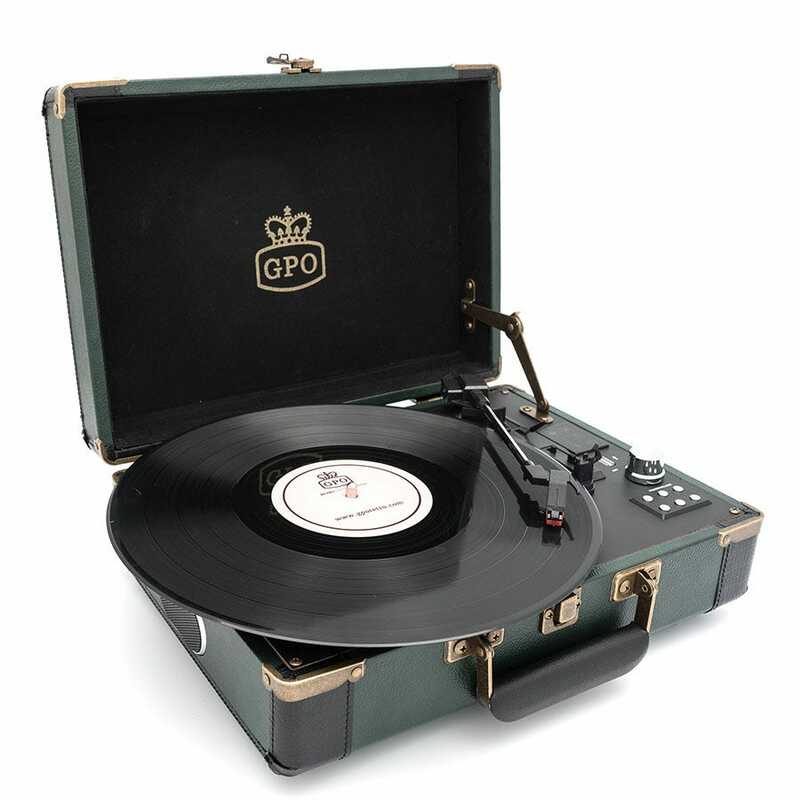 We are comparing prices for GPO Ambassador 3-Speed Bluetooth Record Player - Green and Black in new condition sold by Currys Pc World, Argos.